Did you notice lately that we have been using the word 'authentic' indiscriminately in every restaurant's marketing shtick? Even Google seems to wonder whether you are thinking of butter chicken recipe, when you say 'authentic'. Is there such a thing as authentic 'Indian taste'? The answers are as mystifying as our Indian spices to the free-spirited, yet unprepared foreigner, with its pungent smell capable of inducing strong reactions. The truth remains that in a rich, diverse country like ours,there are a billion right answers for these questions. Taste is as much a private affair as religion once was. How can you explain a madarasi's indulgence with frothy davara filter coffee to a dilli jaat who savors the intense spiciness flooding his senses as the golgappa's shell cracks open? If we care enough about our next generation and their right to enjoy their rich legacy of taste, we need to share our experiences and values we have derived from our favorite eateries in our own, little Indias. Maarewa is a platform that lets people exactly do that. By providing people a place to share and talk about eateries from every corner of India, Maarewa hopes to curate all kinds of eateries that are culturally linked to a specific region, locality, ethnicity or traditional production practice. Sounds like a Wikipedia for Indian Tastes? Well, it aspires to be that. While doing this, it also hopes to connect people by letting them share their food stories around eateries through photos, videos and articles. In the true spirit of the Web, Maarewa wishes to let its platform grow organically, and, in the process, break down every barrier, step by step, for people to connect with each other around their religion of tastes. When I discussed about this project with my friends, while few shared heartening enthusiasm, others remarked that they wouldn't bother to go beyond a tweet or a post in Facebook, when they discover a new eatery in town. With the ongoing explosion of social data eating away our history, I find its implications deeply disturbing. The resultant loss would be incalculable as these posts containing such precious information drain away in the sink hole of social data. So what else can we do? If we begin to archive our diverse food experiences in Maarewa, it would benefit the entire community of web users at large. What drives contributors in this journey to discover Indian tastes is the possibility that WE can contribute to the ineffable joy of a stranger who discovers an amazing street food stall through our small, collective acts of gratitude. One such serendipitous discovery for us was Chache, as we walked through the narrow lanes of Varanasi with an insatiable curiosity to explore our roots. Our hearts swelled in joy as we ate Puri & Aloo Sabzi at this 100 year old eatery. When we shared our intent to archive such amazing eateries with the owners, they shared with us that Chache, after whom the shop is popularly known, died a week ago. With a beaming smile filled with reverence towards their Chache, the third generation of owners told us that they reopened their shop in no time, soon after the tragedy struck to keep their Chache's memories alive. You could also contribute towards discovering innumerable Indian tastes. All it takes is just the name and location of an eatery to create a page for your favorite food joint. You simply have to 1) Sign-in using Facebook or Twitter or Google 2) Click on "Add an eatery" and fill in your information. 3) Press Submit. Voila! Your page is live! Even if you don't have a picture or much details about the eatery, you need not worry. The community would chip in to add more details and enrich the page as it goes along. Even if you fill in the page with minimal details, you can share it with your friends through social networks. Every page you create about an eatery belongs to you and your community at large. You are free to come up with interesting ways to promote your favorite eatery in town as well! 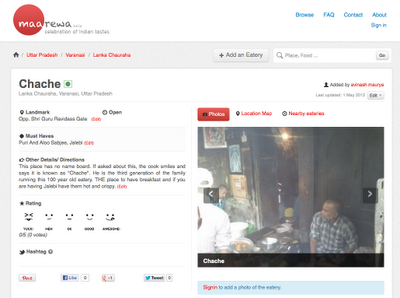 You can check out the eatery page of Chache below. These pages can be shared easily across all social networks. Every time we discover a new eatery in our neighborhood, we strengthen the fabric of the rich tapestry of Indian taste! What really draws me as a visitor and contributor to Maarewa is that it is authentic enough to not include the word entirely in its site! P.S. Maarewa is in perpetual beta mode. Please share your feedback on the site. Let's make it better. P.P.S. If you don't find your favorite local eatery in Maarewa, add it right away! Foodies would be keen to try it out! You better do it now!